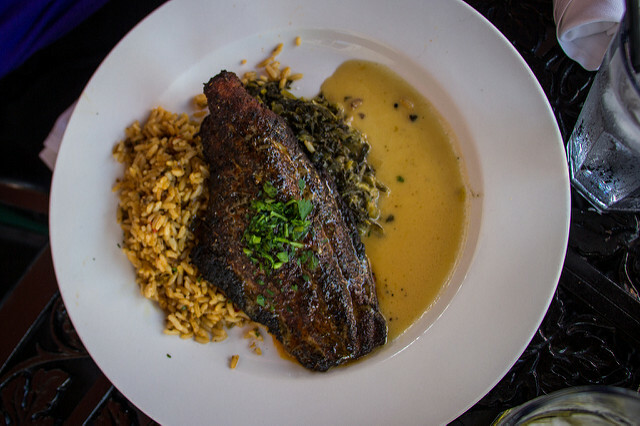 Give our blackened catfish recipe a try if you're looking for a change of routine. This recipe that comes your way courtesy of a cousin from Louisiana, is packed with flavors that will heat up your dinner table. This Cajun style entree has just the right touch of spices to give your taste buds some savory flavors. What I like most about this blackened entree, is that it's ingredients are inexpensive to purchase. Using ingredients you most likely already have in your kitchen cabinets you can cook up this flavorful entree in little to no time. This recipe also calls for the catfish to be cooked in a cast iron skillet or large heavy bottom skillet. Even better, this recipe is easy to prepare and you get good results. Here is the recipe for your cooking pleasure and enjoyment. Rinse catfish fillets under running cold and then thoroughly pat them dry with paper towels. Make your seasoning mixture by combining crushed dried thyme leaves, cayenne pepper, black pepper, salt, garlic powder, onion powder and paprika in a small bowl. Brush melted butter lightly over catfish fillets and sprinkle with blackened seasoning mix. Repeat for other side. Be sure to completely coat each fillet. Heat iron cast skillet until it is very hot, about 10 minutes. Pour the leftover butter into your skillet. Carefully place the catfish fillets into the skillet and cook for about 4 minutes on both sides. This blackened seasoning mixture will produce plenty of smoke in your kitchen, so another way to tell when to turn over you fillets is when the smoke turns gray. You can serve your blackened fillets over a bed of white steamed rice. You can also add lemon juice to the top of each fillet. I also recommend Caesar or Garden salad with baked potato. Enjoy your skillet fried catfish.